Refinancing can be a great financial move for you and your family. It can help you get a better interest rate on your home loan, lock in a better rate, or even lower your monthly payments and free up cash in your budget. That’s not always the case, though, and it might not be the right move for everyone. If you’ve been thinking about refinancing your home loan, there are a number of things our Bronx real estate lawyer wants you to consider before you sign on the dotted line. …cost you more than you’ll end up saving? Refinancing isn’t free. Remember all those fees you had to pay when you originally closed on your mortgage? You’ll be paying a lot of those all over again, so you’ll need to ensure you can cover those costs. When you refinance, you may have to pay points (one point equals 1% of the total home loan amount) which can equal way more than you’ll end up saving on the deal. Make sure you look closely at the numbers and are totally clear about what you’ll need to pay at closing and what your monthly payments are going to be. 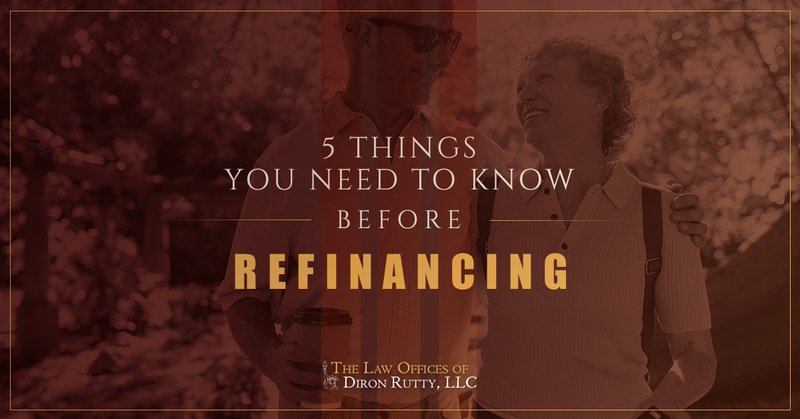 Unless you have other reasons for refinancing, this will almost always stop a borrower from going through with the deal. …require you to pay private mortgage insurance? If you don’t have more than 20% equity in your home at the time of your refinance, your lender will almost certainly require you to pay private mortgage insurance on the loan. This insurance policy helps compensate your lender in case you default on the loan. That’s a good deal for your lender, but it could be bad news for you. Private mortgage insurance can be relatively expensive; it could actually end up making your monthly payment more expensive after you refinance. Talk to your lender to see if you’ll need to pay private mortgage insurance, and if you do, how much it will add to your monthly payments. …be incredibly difficult to qualify for? Refinancing loans aren’t easy to get. Even if you have great credit, you might find them to be pretty difficult to qualify for and even harder to find a good deal. That’s because many lenders were burned on refinancing deals during the housing crisis, so they are less eager to hand them out to borrowers. There are still great deals out there to be found, but finding them might be harder than finding your original home loan. If you are a homeowner, you probably deduct your mortgage interest off of your taxes. For a lot of people, this can reduce the amount of tax that they owe by a significant amount. If you are paying less interest after the refinancing deal, though, you will be deducting less on your taxes. How much less could make you think twice about finalizing your refinancing deal. You may want to discuss the implications with your tax professional first. …make your debt-to-income ratio look bad? When it comes to finding a good refinancing deal, your debt-to-income ratio is suddenly going to be more much important. This is one of the main factors lenders will consider when deciding whether or not you are a good candidate for a refinancing loan. That means you might need to pay off a large chunk of your debt before your refinance (which, ironically, might have been easier to do after you refinanced and lowered your monthly payments). If your debt-to-income ratio is over 35%, you will have a tough time finding a deal. If you are exploring the option of refinancing your home, it’s important to have experienced professionals working for you to help you determine that you are getting the best deal and that your rights as a borrower are being protected. That’s why we recommend speaking to a Bronx real estate lawyer long before you finalize your refinancing deal. Get in touch with the Law Office of Diron Rutty and speak to a member of our team today. We’ll arrange a complimentary consultation with a member of our legal team so you can get answers to your refinancing questions and receive the help you need to ensure a successful refinancing experience.